We love turning our favorite appetizers into full and hearty meals. Tonight's dinner comes from the not-so-healthy appetizer choice of nachos. Well, we love nachos and just can NOT seem to order them when we go out. The typical nacho platter has well over 1,000 calories and that is being served up as a starter. How ridiculous is that. Join us tonight as we turn this fattening appetizer into a healthy, delicious and filling dinner! No, you are not seeing things, there is in fact asparagus in that picture. Why not? If we are going to eat cheesy nachos we are certainly going to PACK the dish with healthy veggies. This is a great use what you have on hand meal so go ahead and throw in all your leftover veggies! This dish is right around the 500 calorie mark which is right around where we like to keep our dinner calorie count. Believe us when we say you are not going to feel like you are eating healthy tonight. 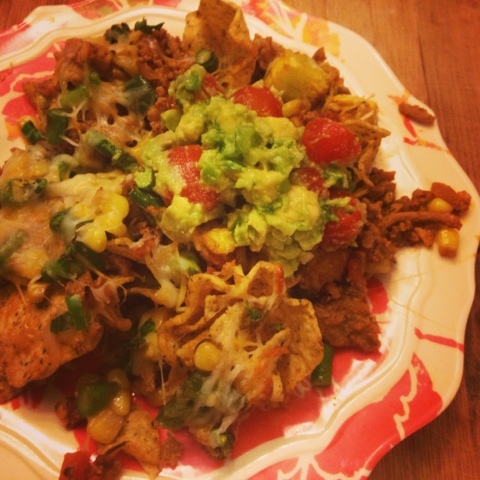 So go ahead and fool your brain (and your hubbies) and treat yourself to these heavenly nachos tonight! 4. Line baking dish with tin foil, spray with non-stick spray and toss all tortilla chips onto dish. Add meat mixture, then veggies, then Mexican cheese, then 1/2 of freshly chopped cilantro. 6. 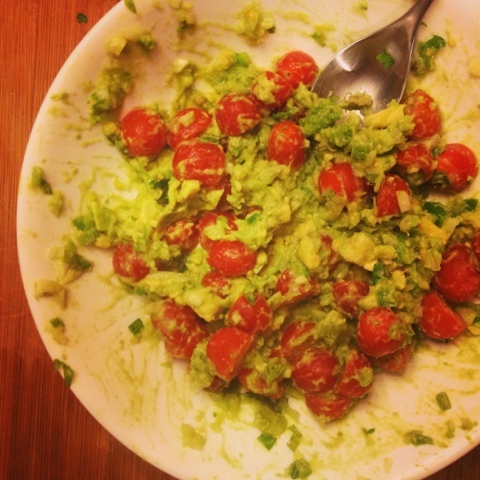 While nachos are in the oven make the guacamole topping. Scoop out avocado and give a quick mash. Add pinch of salt, 1/4 of minced yellow onion, 1 minced garlic clove, chopped tomatoes, juice of 1 lime, and the remaining cilantro. 7. 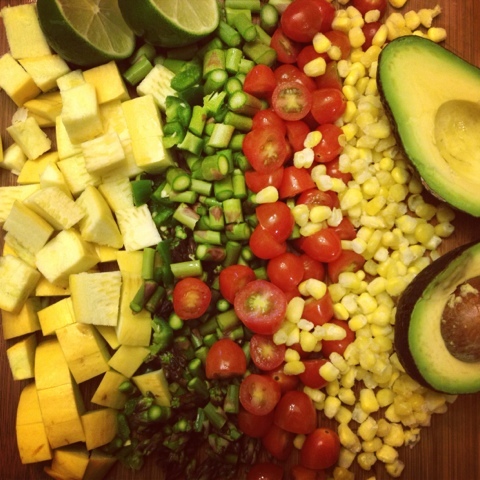 Portion out 1/4 of the nachos and guacamole topping per person and enjoy! Wow... love your blog! Newest follower here. I was hoping that you might stop by and follow me back if you like what you read! New follower here from the blog hop. Looking forward to reading more of your blog and lovely recipes! Thanks so much Janine!! So glad you are enjoying the egg white muffins! We love them too :) Hope you liked the eggplant stacks! And we hear you, our hubbies are big eaters too ;) They were huge fans of the nachos and had no idea they were health food! Just came back for the recipe (its bookmarked lol) making these for the 2nd time, there incredible and the bf was raving about it! I just picked up some squash grim the farmers market, do you ladies have a butternut squash soup recipe? Thanks!